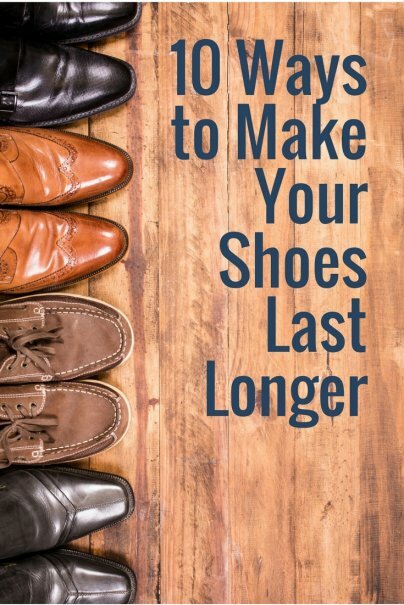 With that in mind, take a look at these 10 ways to make your shoes last longer and your clothing budget go farther. Like anything else you purchase, focusing on quality when you're buying a new pair of shoes will pay off in the long run. Well-constructed shoes can handle much more wear and tear than a cheap pair, and you won't have to keep replacing them so often. The materials used matter, too. Choose shoes made of natural materials like leather or suede. The soles of your shoes are what take the brunt of the daily beating, so it's important to protect them to ensure that your shoes last as long as possible. You can find protectors for all kinds of shoes online, like Sole Protectors for sneakers and KiiX for high heels. For canvas shoes especially, it's easy to toss them in the washer and dryer for a quick cleaning, but that will just wear them out faster. Scrub the shoes by hand instead, and do it immediately so the dirt doesn't start to accumulate to a point of no return. There are several benefits to stuffing your shoes with newspaper, like alleviating odor, drying them out if they get wet, preventing dry rot, and preserving their shape. "Always, always, always spray your shoes with water repellent," pleads Sandra M. Einstein, an organizing and coaching consultant. Waterproofing your shoes will protect them from the elements, which is especially important when the winter weather rolls in. In addition, you also want to wash off salt that may get on your shoes to avoid stains. Think you've broken your shoes? You may just need a restoration. "Is the leather looking dull and you can't find shoe polish in that color?" asks freelance writer and author Carol Gee. "Chances are your local shoe repair person does. I once scraped the toe of my favorite grape-colored pumps while walking up some concrete steps. I took them to shoe repair guy who matched the color, replaced the taps on the heels, and buffed them to look like brand-new." Damage to your shoes isn't always done while they're on your feet. Where you're storing them after you take them off can contribute to their deterioration, so it's important to find just the right spot. Women's Health magazine says that keeping your shoes in the wrong places could cause fading, scratching, and other damage. Keep your shoes away from sunlight, and don't just throw them in the closet. "Neatly line them up in pairs on your closet's floor or on a shelf with ample breathing room between pairs," the mag advises. Your foot isn't likely to slide effortlessly into a shoe with laces. You usually have to do a little work to get them on, which often results in crunching the heel collar with the bottom of your foot while you work your fingers in. You can avoid this entirely and keep the heel collars in good condition by always using a shoehorn, says Joe Rocco, owner of Jim's Shoe Repair in New York City. Keep your dress shoes sparkling by spot cleaning them after every wear. After they're clean, apply polish to any scuffs or marks that may have occurred. Once the polish is dry, buff them with a rag or an old T-shirt and. If you're consistent in this practice, your shoes could last decades. Seriously — moisturizing your shoes is totally a thing. It mostly applies to leather shoes, and it helps prevent potential cracking due to damage from the elements. Just like you bought quality shoes, however, you want to get a quality shoe moisturizer. "A quality shoe cream will absorb into the leather, nourish your shoes, and keep them fresh," says Andrea Mitchell, editor of the blog Fox in Flats. "Avoid shoe creams that sit on top of the leather — they provide a temporary solution only, and will rub off on the hem of your pants. Not cool." Do you have any tips on how to make shoes last longer? Please share in comments! Great tips, especially #6. Our society has become accustomed to throwing away everything and buying new, even if it's just a small issue. Our local shoe repair shop has saved many pairs of shoes for us, at a tiny fraction of the cost to replace them. That's really good ways to keep your shoes longer. But I also think that getting a pair of high-quality shoe is the most important way. Payless shoes for $19 last longer than the $50-70 nike. I blow out a Nike in a month or two when the cheapo ones last years. They may not be as comfortable but at least they do not blow out.